Joe Hill’s follow-up to his fantastic novel The Fireman is a collection of four novellas, titled Strange Weather. Of course, being a fan of Joe Hill, I purchased my copy of Strange Weather the same week it was released. But, in kind of a first, I got my copy as an e-book through Google Play. Not that this will become the future standard for my literary indulgences, mind you. Just went with this format for kicks and giggles. So, four short novels collected in one binding. Let’s dive in and see what came out of Joe Hill’s brain droppings, shall we? A successful middle-aged man reminisces back to the summer of 1988, where he runs into a creepy guy with a camera you really don’t want to have your picture taken with. This was a pretty taught thriller with an object that seems to call back to the Stephen King novella “The Sun Dog” from the Four Past Midnight collection. But, “Snapshot” is far from a rip of that story. The two feature instant cameras that do weird stuff, and that’s where the similarities end. The camera in “Snapshot” is far more sinister. The story also manages to be emotionally wrenching, with the theme of losing your identity and saying goodbye to your past. I also found myself empathizing with the main protagonist, as I too was the fat young teenager back in ’88. What a year. No creepy gangly old men with cameras, though. That I know of. A disgraced mall security guard shoots and kills the jilted mistress of another mall store manager, a Muslim woman and her infant son shee was carrying, and a young man who witnessed the incident, thinking it was all a terrorist attack. He’s hailed as a hero of the community, everyone praising him, including his estranged wife and young son. Until a reporter from the local paper starts digging for the truth, and the “hero” finally snaps under all the pressure. “Loaded” is one of those super tense thrillers where the real life terror depicted in the story is only amplified by the real life horror that plays out on the news at home, with shootings seemingly on the rise. Hill did a rather good job with making the antagonist nunced and sympathetic to a point; though in no way do you really side with him, as what they’re doing is despicable, but you can kinda see where he’s coming from. Overall, a very good story that rather pissed me off with the ending, there. Well done, sir. Well done. A young man’s first attempt at skydiving, to honor the wishes of a friend that died of cancer, results in him getting stuck on a cloud that’s not really a cloud (at least, it doesn’t act like actual clouds do…which is an understatement), and he’s stuck trying to figure out how to get down, and the cloud doesn’t seem to want to let him go. The fun thing about speculative fantasy fiction is the taking of an otherwise absurd-sounding concept, and spinning it into a yarn that makes it work. “Aloft” does just that, with a concept that sounds more like a comic strip gag — a guy skydives and gets stuck on a cloud. Joe Hill takes this and makes it right engrossing, giving things a nice mystery surrounding his situation, as well as working out some relationship issues. One afternoon in Boulder, Colorado, it begins raining razor-sharp crystalline shards that kills or seriously wounds anyone caught outside in it. This includes the girlfriend of our story’s protagonist, who, soon after the first freak storm, sets out on foot to Denver to try and find her girlfriend’s father to inform him of his wife and daughter’s tragic demise from the freak storm, and try to make heads or tails of what’s going on, and try to survive. In a note in the afterwards portion of this book, Joe Hill admits to writing “Rain” as kind of a satire of his own post-apocalyptic novel The Fireman. Maybe I’m not smart enough to get the satire part; it’s probably too subtle for a meathead like myself to notice the first time reading. I do, however, recall reading a story in a collection of youth-oriented science fiction stories back in grade school, one that involved a kid playing outside on a planet his human family have settled on, and almost getting caught in a flash storm that rained sharp crystals from the clouds, much like in this one. Only, that story wasn’t as nuanced or, you know, set on Earth as “Rain” is. A lot more plot, a lot more character development, and…well, let’s just say this is probably the best kind of kooky cult types you want to be stuck next to. Give or take singing Genesis songs in the middle of the night. Once again, Strange Weather manages to solidify Joe Hill as one of my top favorite genre writers in the past ten years. He has one of the most fertile imaginations I’ve had the pleasure of experiencing, and this collection is further proof of that. Highly engrossing, time seems to just fly by as I read this. Highly recommended, this. When the lights are on, he’s a mild-mannered, #1 worldwide bestselling author. When the lights go down, he watches his creations come to shattering, electrifying LIFE! (Cue horror movie music)… On the big screen, that is. For Stephen King, the experience of seeing his works of short fiction adapted for major Hollywood films has created stories of its own, and he shares them here – five of his celebrated short stories, plus King’s personal commentary, his all-new introductions, and essential, behind-the-scenes insights. When I first saw tis interesting-looking mass paperback sitting displayed prominently on the New Release rack at Wal-Mart, it looked on the surface to be another non-fiction book, the author musing about his stories that have been turned into movies. That would have been one heck of a read- the master of modern storytelling discussing the various adaptations through his career; the chapter on Stanly Kubrick’s take on The Shining would have been worth the price of the book itself. The cover on Stephen King Goes To The Movies makes it seem like one of those type of books: the blurb up top reads “The #1 bestselling author reflects on the filming of five of his most popular short stories. Follow him into darkness- if you dare!”, so I think I can be given a pass by immediately picking this title up on that assumption alone. Had I read the back cover description, I would have come across the part that read “five of his celebrated short stories, plus King’s personal commentary, his all-new introductions and essential, behind-the-scenes insights.” There it is. Nobody’s fault but mine, really. 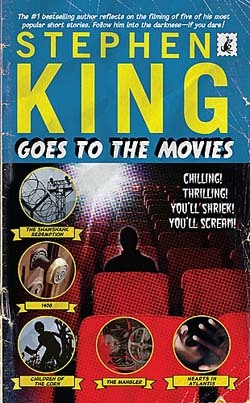 So, essentially Stephen King Goes To The Movies is a repackaging of three short stories and two novellas that have appeared in other story collections – “The Mangler” and “Children of the Corn” from Nightshift, “Rita Hayworth and Shawshank Redemption” from Different Seasons, “Low Men in Yellow Coats” from Hearts In Atlantis, and “1408” in Everything’s Eventual – the common thread being that each one have been made into full-length movies. The newer introductions by Stephen King are interesting enough, but far too brief, each being a page or so in length. Otherwise, I already own the collections four of the stories appearing; the lone holdout would be “Low Men in Yellow Coats”, and at nearly 350 pages in length somewhat justifies my buying this rehash collection without feeling too ripped off. The cover of Stephen King Goes To The Movies looks pretty cool- a mock-up of an old worn EC Comics horror comic, complete with the stress marks on the staples. Other than the all-too-brief story intros by Stephen King, there’s really nothing to justify this rehash, especially for those who already possess the books the stories appear in. Good introduction for curious novices, but for people like me, you’re nothing much if you pass it up.